Six Sigma is a statistical measure of the performance of a process or product characteristic compared to a specification level. A Six Sigma level process would exhibit no more than 3.4 defects per million opportunities. Most company processes produce upwards of 6000 defects per million opportunities which for many is simply not good enough for today’s competitive environment where customer demands increase exponentially. Organizations fail to achieve Six Sigma level of performance will consequently endure very high costs due to poor quality. To achieve a Six Sigma level of performance, a systematic process based methodology and project framework must be employed while personnel at various levels within the organization must be developed to operate and lead the six sigma implementation program. Green Belt – This is a direct entry level. Target audience is senior team leaders and managers or quality and process improvement professionals. Training hour is 30-hours, please click here to view details. Black Belt – To enroll Black Belt course, students are required to be qualified Six Sigma Green Belt or have equivalent qualification/studies. Otherwise, students must pass the examination and assessment for entry. Target audience is Quality, R&D, Process engineer or supervisor. Training hour is 90-hours, please click here to view details. 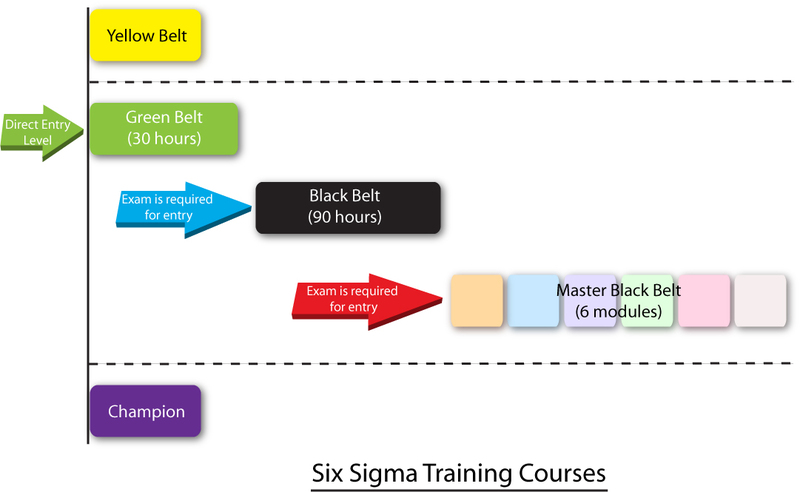 Master Black Belt – To enroll Master Black Belt course, students are required to be qualified Six Sigma Black Belt or have equivalent qualification/studies. Otherwise, students must pass the examination and assessment for entry. The course contains five modules, please click here to view details. 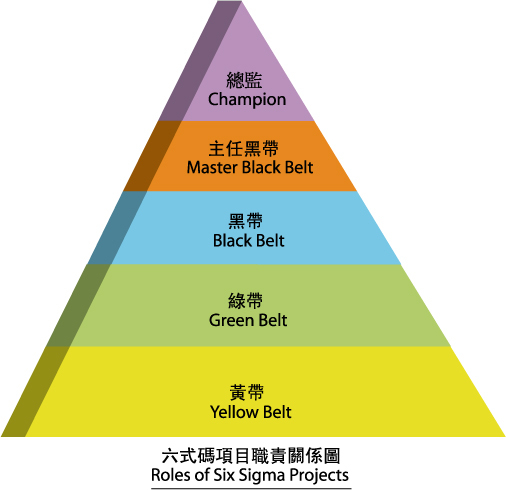 Yellow Belt – Students with less than two years of work experience and are required to participate Six Sigma project. Champion – Senior executive or management who has ultimate responsibility for the business and Six Sigma project. If you want to know which level is suitable to you, please refer to below explanation of Six Sigma Project Roles or contact us directly for enquiry. Responsibility: person who has ultimate responsibility for the business and Six Sigma project, in charge to allocation of project resources and provides supports to Black Belt in project implementation. Responsibility: responsible for overall trainings to train the Belts, communication with the top management to translate company strategies into Six Sigma projects ; and reviews of different projects in the company to identify improvement areas and provide technical supports. Responsibility: to lead the project team and guide Green Belt to solve problems and complete the project. Responsibility: to execute the project but need to take care original jobs at the same time. Responsibility: provides helps to Green Belt in project implementation.